There are two rendering modes on Sketchfab: Classic and PBR (Physically Based Rendering). By default, uploads are set to PBR mode. This is almost always the best choice. It provides more realistic material and lighting, and does not prevent anything that could be done in a Classic workflow. Sketchfab supports multiple materials and objects in your scene. Give each material a unique name because the 3D editor merges objects by material name. Avoid special characters when naming. If possible, you should join every mesh that shares a material because it helps performance. When uploading the Wavefront (.OBJ) format, the material library file (.MTL) should be included for best results. Sketchfab supports a maximum of 100 materials. If we detect more than 100 materials during processing, we attempt to merge identical materials. If there are still more than 100 materials, we merge everything together into a single material. If you are not using texture images, you can choose a color for any slot from the color picker. Textures are images mapped to the surface of your model. For details on shaders/texture slots, see Materials (PBR). Upload textures with your model file or embed textures in the model file (e.g. .BLEND, .FBX). You can put image files in the same folder/directory as the model file, or a sub folder/directory. If your textures are properly referenced by the model file or use our naming conventions, they will be automatically applied to your model. When using the Wavefront (.OBJ) format, the material library file (.MTL) should be included for best results. If you need to add textures after uploading, you can use the texture manager or drag and drop images into their slots in the material editor. Anything that is not .JPG or .PNG is converted to .PNG. See Processing & Compression. .TGA is converted to .PNG. The maximum supported file size per texture is 75MB and the maximum supported resolution is 8192px × 8192px. However, we recommend staying well below this limit whenever possible. Such large images use a lot of resources, and are usually overkill. See Processing & Compression. Sketchfab only support RGB and Linear images. Using another color space such as CMYK can have unexpected results. Textures are compressed to minimize model download times. We convert any image that is not .JPG or .PNG to .PNG. Then, we generate compressed versions of every texture. The format and level of compression depends on the image attributes and channel requirements: RGB, Luminance, or Alpha. We do our best to minimize file size without affecting visual quality. We also generate multiple resolutions of each texture at every "power of 2" between 32×32 pixels and the original (up to 8192×8192). For example, if you upload a 1024×1024 texture, we will generate 32, 64, 128, 256, and 512 versions. Depending on your device, these are used in "LD" and "SD" modes in the viewer. For performance reasons, non-"power of 2" textures will not be used; the viewer uses to the closest, smaller version. Textures are re-processed each time you change Material settings, with a small delay. This can take 10-15 minutes to complete. 3D Settings always uses full resolution, uncompressed textures. If you experience issues with compression artifacts, especially on normal maps ("blocky" or "pixelated" textures, please see this post. Use our texture naming conventions to help us automatically choose settings and apply textures to the right shader slots. The format is "MaterialName_suffix.extension". For example, if you have a material named "Material1", you could name your textures like "Material1_diffuse.png", "Material1_metallic.png", etc. Avoid material names with special characters, especially periods '. ', underscores '_', and hyphens '-' because it can break the match. Avoid material names with matching sub-stings, for example "handle" and "woodenhandle" in the same scene. If the model has only one material, we will apply textures based on the shader name match regardless of the material's name or the position of the string in the name of the image file. Make sure you include the image files with the upload, and the .MTL file when uploading .OBJ. Make sure the path and file names linking the textures are correct. Try uploading your textures manually in 3D settings. If applying a texture does nothing, or seems to apply a solid color, this can indicate a UV-mapping problem. 3D scans and models with baked lighting often look best in Shadeless mode. Avoid spaces and special characters in your material, texture, and file names. Name everything with ASCII / UTF-8 compliant characters. Avoid image sizes bigger than 8192×8192 pixels. Avoid image file sizes bigger than 10MB. Avoid color spaces like CMYK. For performance tips, see Viewer Performance. There are four options for texture filtering. Trilinear: Usually the best choice, especially for large textures. Nearest: Legacy, use Nearest (mipmap) instead. By choosing the appropriate format, texture opacity can be encoded either as an alpha mask or by grayscale levels. Sketchfab supports sRGB and Linear RGB colorspaces for textures. You can switch between them in the Material Editor's Manage Textures dialog. If you're unsure, Auto is the best choice. If you have more than one UV channel on a single material, you will see an additional interface option to switch between them. UV Offset and Tiling are not currently supported. Proprietary renderers/shaders like V-Ray, and Mental Ray should have their lighting and textures baked for best results. The 3ds Max Exporter, for example, is able to bake materials and upload to Sketchfab automatically. KeyShot currently offers no baking features and very limited material encoding in supported formats (STL and OBJ). Keyshot users should prepare materials/textures in other software or use PBR mode in Sketchfab without textures. Is it actually possible to bake lighting and texture from Keyshot, googling would seem to suggest not? booo, making fbx not have texture is like not having water in the ocean. Hello James. Have a Sketchfab support import model with animation like a FBX Review? Its realy will be great for show 3d porfolio for animators. Not yet, but animation is a big milestone for us in the future! Can I pack textures to chanels ?? R-metallic, G-spec, B - ao etc. Les memory better performance special on web and mobile devices. Now im working with simple matcap shader that use only "Normalmap" and im using only R+G for normals, B is ambient and A is alpha. @KrzysztofZwolinski - Not completely, but it's something we might implement in the future. You can do it with a few specific slots. Alpha Blending/Alpha Masking can use Alpha (A) or Luminance (R). Emission can use Luminance (R), and Base Color/Albedo can use Luminance (R). Hi James, could i use animated textures in future? say upload a small gif for a blinking eye , or a short looping video clip to play on a TV on an exhibition stand or similar? @clockworxdesign - Yes, it's something we're experimenting with. Hello can anyone tell me which type of normal map is accepted in Sketchfab, DirectX (X+, Y-, Z+) or OpenGL (X+, Y+, Z+) ? How to set in MTL file Diffuse / Albedo, Metalness, Specular, Roughness, Glossiness, Ambient Occlusion, Cavity, Normal, Bump, Emission, Opacity? Where an example? @James - Before update work suffixes. Now textures do not automatically choose. @degit22 - Ah, I'm sorry. I think it might be related to this bug. Could you try the workaround here? Unity3d uses specular map from alpha channel. Is it possible to use it right from the texture alpha channel or I should use unique specular map? For Classic materials, we support RGB and Luminance (R) in the specular slot, but not Alpha (A). For PBR (Metalness workflow), Specular F0 map is optional, but we expect a linear, grayscale RGB image. For PBR (Specular workflow), we expect an RGB map in the Specular slot. So, in your case, yes I think you should use a unique specular map. In agisoft photoscan I can set 'UDIM texture layout' when exporting OBJ. Should I set this or not? @frankmaraite - I'm not really sure what that option does, but I never set it when I use PhotoScan. *coughs* So... I don't blame you from laughing at this, but I made a prop last night and was using sketchfab as a previewer while I was working on it at a public PC, so anyway, the computer decided to crashed and the files ended up becoming corrupt. So yeah, I was wondering if there is a way to retrieve my textures when the download property is a .blend file. If you packed the texture in the .blend file before exporting, you should be able to extract them in Blender. If not, you can grab them from Developer Tools > Resources. @jk76 - looks like you got some answers on the forum? 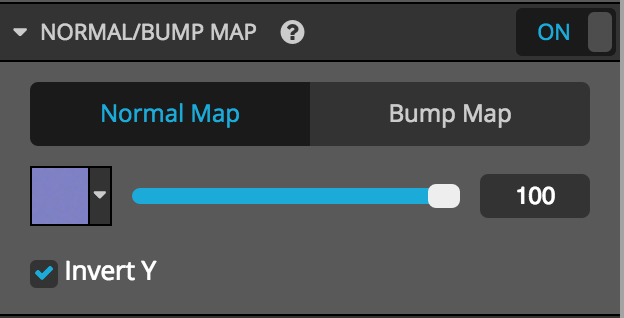 Why "Invert Y" in the normal map would be a default setting ? Is it possible to let us to choose "Invert Y" option at once for all materials ?